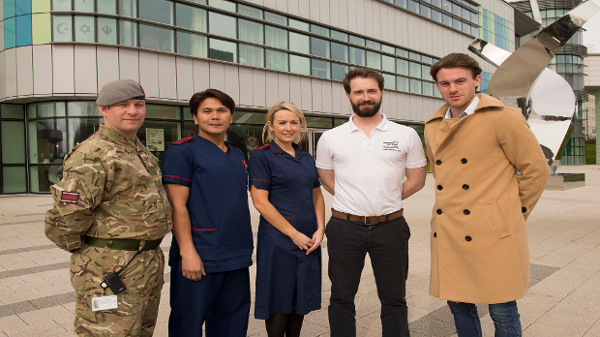 The SRMRC are teaming up with the Critical Care department at Queen Elizabeth Hospital Birmingham (QEHB) and QEHB Charity to take on the Yorkshire Dales Three Peaks Challenge. On Saturday 6th June, kind-hearted staff alongside former patients and their friends and families will be completing the gruelling 25 mile trek, raising money for trauma research every step of the way. They will find support along the route from the other hospital staff and some of the SRMRCs highly successful patient and public involvement (PPI) group members. Leading the hike will be Sister Aisling Clarkson, senior trauma research nurse in the SRMRC. She explained, “After several years of undertaking extreme challenges for external charities, this year we’ll be tackling three mountains over 25 miles for the hospital’s official charity. “This is a fabulous way to raise awareness of and money for trauma research. Every penny we can find will help us towards buying new equipment, developing new treatment methods, and improving trauma patient outcomes. All proceeds will go into QEHB charity’s trauma research fund, which has been founded specifically to support the SRMRC’s innovative research. Justine Davy, head of fundraising, said, “We are proud to collaborate with the SRMRC, whose research investigates novel methods for treating trauma patients from the point of injury through to post-hospital care. “As an acute hospital, the QEHB sees a large number of patients with traumatic injuries enter its doors each year, and it’s important that we continue to push new boundaries on treatments, equipment and standards of care. To get involved with the challenge please email ResearchSRMRC@uhb.nhs.uk or telephone 0121 371 4223. To make your donation to the NIHR SRMRCs Yorkshire Dales three peaks fundraising challenge, which is raising money for the QEHB Charity’s Trauma Research Fund please visit: www.justgiving.com/nihr-srmrc-reseachteam/. For more information about QEHB charity please visit http://www.qehb.org/.